World Archeology: Is treasure hoard found in Germany linked to Nibelung legend? Is treasure hoard found in Germany linked to Nibelung legend? 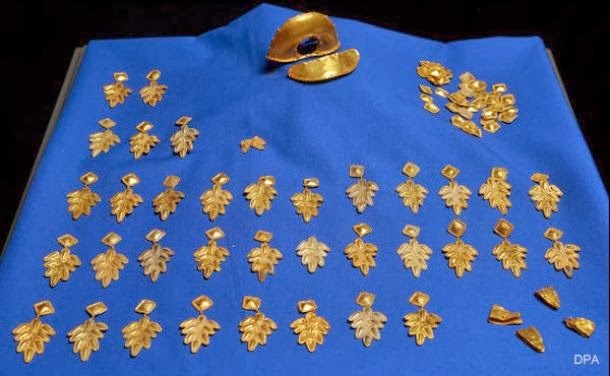 An amateur treasure hunter equipped with a metal detector has discovered a hoard of gold and silver dating back to late Roman times in a German forest. The finding has prompted speculation that it could be the legendary Nibelung treasure. 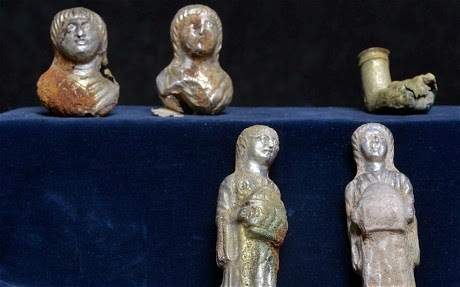 The unnamed treasure seeker came across the buried treasure, estimated to be worth more than €1 million, while searching a wooded area in southern Rhineland-Palatinate with a metal detector. The trove includes numerous leaf-shaped solid gold brooches, which are thought to have formed part of the decorations from a coat of a Roman ruler, as well as a solid silver bowl set with gold and stones set within it, and a set of gold and silver plated statuettes which formed part of a military commander’s portable chair. 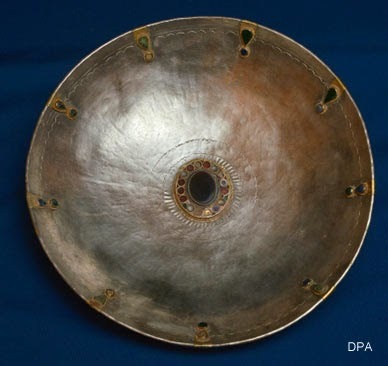 Experts say the treasure, some of which appears Eastern European in style, was buried around 1,500 years ago, about the time when Germanic Teutons were plundering and pillaging their way through the crumbling Roman Empire. “In terms of timing and geography, the find fits in with the epoch of the Nibelung legend,” said Axel von Berg, the state’s chief archaeologist. “But we cannot say whether it actually belongs to the Nibelung treasure,” he said, adding that whoever owned it had “lived well” and could have been a prince. The Nibelungs is the most famous Epic in Norse mythology and is said to be based on the Royal family of Burgundy. The story begins when a treasure of the Burgundians falls into the hands of Siegfried. After helping King Gunther woo Brunhild, Siegfried marries Kriemhild, Gunther's sister. Ultimately, a row between the Queens leads to the death of both Siegfried and Kriemhild, and the loss of the treasure. Whether the treasure is the famous “Rhinegold” or not, it seems to have been buried in haste by its owner or by robbers in around 406-407 AD, when the Roman Empire was falling apart in the area along the Rhine. Prosecutors have begun an inquiry into the hobbyist who discovered the treasure because they suspect he may have sold some of it, possibly to a buyer abroad.